This year, instead of running a 30-second ad during the big game, SKITTLES® is creating the first-ever commercial performed as a live Broadway musical. 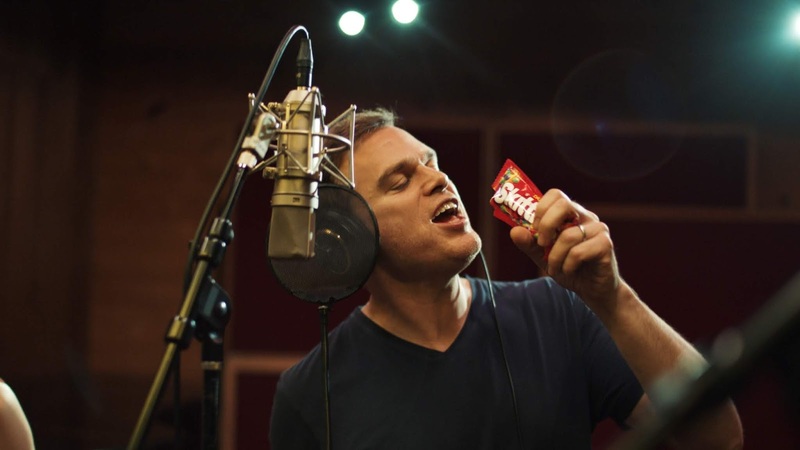 "Skittles Commercial: The Broadway Musical" is written by playwright and Pulitzer finalist Will Eno in partnership with DDB Worldwide. The 17-member cast, led by a soon-to-be-announced celebrity, will perform the show one time only, in front of a live audience at The Town Hall in New York City on Sunday, February 3 at 1 p.m. EST. The show will also feature original songs backed by a live band. Starting today, tickets to the live performance are on sale and available to the public at Ticketmaster.com. Ticket proceeds will be donated to Broadway Cares/Equity Fights AIDS*—a nonprofit organization that awards annual grants that help men, women and children in all 50 states, Puerto Rico and Washington, D.C., receive lifesaving medications, health care, nutritious meals, counseling and emergency assistance. SKITTLES will also match this donation**. "We're always looking for opportunities to innovate and entertain our fans in new ways around football's biggest stage," said Debbie Litow, Brand Director, SKITTLES. "And what better way to do that this year than by bringing our ad to the world's most famous stage: Broadway." SKITTLES is known for taking a unique approach to the big game. Last year, the brand created a highly exclusive ad that was shown to only one person. 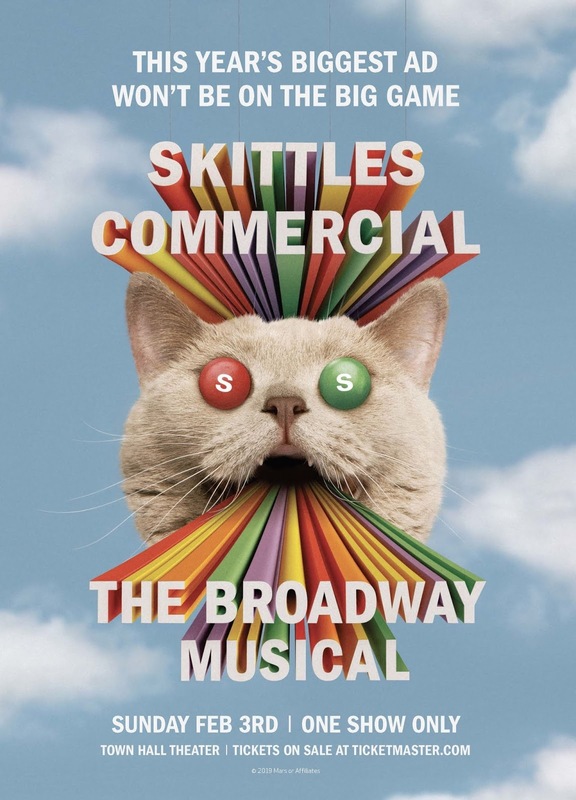 Stay tuned as SKITTLES reveals details about "Skittles Commercial: The Broadway Musical" throughout the month leading up to the live performance on February 3. 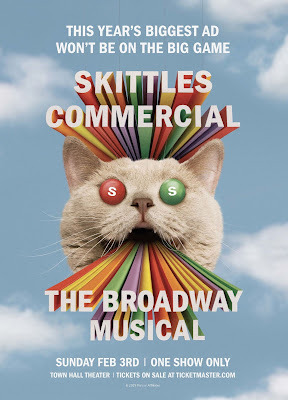 Fans can learn more about "Skittles Commercial: The Broadway Musical" and purchase tickets by visiting SkittlesTheMusical.com or the brand's Facebook, Twitter and Instagram pages. *For every ticket purchased for "Skittles Commercial: The Broadway Musical", Mars Wrigley Confectionery US, LLC will donate 100% of the purchase price less any third-party handling, convenience or other fees and taxes to Broadway Cares/Equity Fights AIDS. Your purchase is not tax deductible. For more information about Broadway Cares/Equity Fights AIDS, visit https://broadwaycares.org. **In addition, Mars Wrigley Confectionery US, LLC will match the amount of ticket sales up to $50,000 but not below $25,000 regardless of ticket sales. Mars is a family-owned business with more than a century of history making diverse products and offering services for people and the pets people love. With almost $35 billion in sales, the company is a global business that produces some of the world's best-loved brands: M&M's®, SNICKERS®, TWIX®, MILKY WAY®, DOVE®, PEDIGREE®, ROYAL CANIN®, WHISKAS®, EXTRA®, ORBIT®, 5™, SKITTLES®, UNCLE BEN'S®, MARS DRINKS and COCOAVIA®. Mars also provides veterinary health services that include BANFIELD® Pet Hospitals, Blue Pearl®, VCA® and Pet Partners™. Headquartered in McLean, Va., Mars operates in more than 80 countries. The Mars Five Principles—Quality, Responsibility, Mutuality, Efficiency and Freedom—inspire its more than 100,000 Associates to create value for all its partners and deliver growth they are proud of every day. Broadway Cares/Equity Fights AIDS is one of the nation's leading industry-based, nonprofit AIDS fundraising and grant-making organizations. By drawing upon the talents, resources and generosity of the American theater community, since 1988 Broadway Cares/Equity Fights AIDS has raised more than $300 million for essential services for people with HIV/AIDS and other critical illnesses across the United States. Broadway Cares/Equity Fights AIDS is the major supporter of the social service programs at The Actors Fund, including the HIV/AIDS Initiative, the Phyllis Newman Women's Health Initiative and the Samuel J. Friedman Health Center for the Performing Arts. Broadway Cares also awards annual grants to more than 450 AIDS and family service organizations in all 50 states, Puerto Rico and Washington, D.C., providing lifesaving medication, healthy meals, counseling and emergency assistance.